Summary: Use Windows PowerShell to display service dependencies on Windows for troubleshooting shutdown problems in Windows 7. Hey, Scripting Guy! I have a problem on my Windows 7 PC. It hangs on shutdown from time to time. I have done some searches on the Internet, and it seems other people have reported similar problems. The cause appears to be related to either crappy video drivers or crappy audio drivers, depending on whose website I am reading. One site suggested creating a .bat file to stop the services manually before shutting down the workstation. I would like to use Windows PowerShell to write such a script, but I need to find out information about the service dependencies. I looked at using WMI to find service dependencies, but I do not see any information via the Win32_Service WMI class. Can you help me? Microsoft Scripting Guy Ed Wilson here. One of the cool things about Twitter is that it allows you to communicate with thousands of people instantaneously. One of the cool things about Windows PowerShell is that the code can be so short, it fits into the limitations of a tweet. This makes Twitter and Windows PowerShell an awesome combination. As a case in point, I posted a tweet about listing colors that are used by the Write-Host cmdlet. One of the Scripting Guy forum moderators saw the tweet and posted a line of code he uses to display both the console colors and the name of the console color. The cool thing is that I was familiar with the .NET Framework class he used, but I had never written that line of code before. I added it to the discussion in this post. Way cool! While I had Trevor on the line, I also asked him if he would like to write a guest blog article. He said yes, so we have that to look forward. 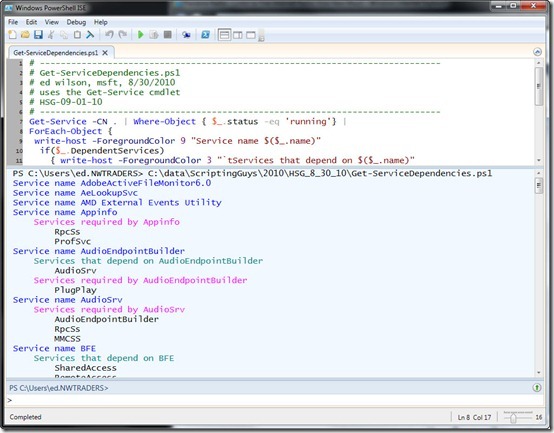 VG, none of that has anything to do with services, but it has to do with the display of service names in the Get-ServiceDependencies.ps1 script that is shown here. The Get-ServiceDependencies.ps1 script uses the Get-Service cmdlet to retrieve information about services on the computer. You can use the Get-Service cmdlet to run against a local computer or a remote computer. When running against a remote computer, the Windows Firewall must be modified to permit the cmdlet through the firewall. In addition, you must have administrative permission on the remote machine. Unfortunately, there is neither a –filter parameter for Get-Service, nor a –credential parameter. This means that all services are returned by the Get-Service cmdlet. It also means that you cannot supply alternative credentials for the Get-Service cmdlet. The ServiceContoller .NET Framework class has two properties that are extremely interesting. 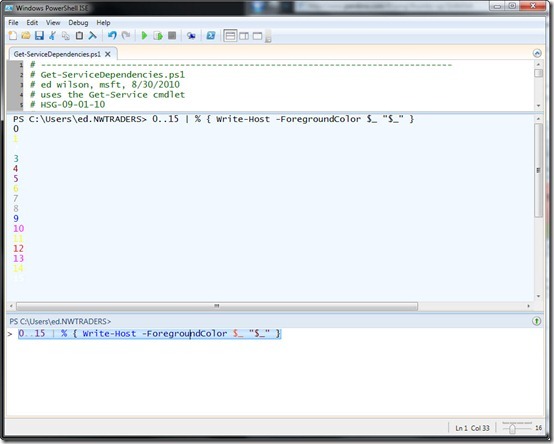 The first one is the dependentServices property, and the second one is the RequiredServices property. This makes it easy to find service dependencies. The ForEach-Object cmdlet takes each ServiceController object as it comes across the pipeline, and allows us to work with them individually. The Write-Host cmdlet is used to write the name of the service to the Windows PowerShell output in color. The color combinations that can be used with the Write-Host cmdlet are limited to 16 colors. However, when selecting colors, I find it hard to visualize how yellow, or green might show up. Therefore, I use a simple line of code to display all the colors to the Windows PowerShell ISE output pane. This is seen here. The 0..15 line creates an array of 16 numbers. This is seen here. Each of the numbers is passed over the pipeline to the ForEach-Object cmdlet. The % symbol is an alias for the ForEach-Object cmdlt. The $_ character refers to the current number on the pipeline. It therefore changes the foreground color to the color represented by the number. As seen in the following image, some of the colors are nearly invisible, and many of the other colors are pretty well washed out. It then becomes a simple matter to select colors that you like and that show up well in the Windows PowerShell ISE output pane. Keep in mind that if you have changed the color scheme for the Windows PowerShell ISE by following the discussion in our recent Weekend Scripter posts about the ISE, you will need to choose different color values for your environment. When the Get-ServiceDependencies.ps1 script runs, the output is displayed that is shown in the following image. VG, that is all there is to using Windows PowerShell to retrieve information about service dependencies. WMI Week will continue tomorrow when we will continue to talk about working with services. We would love for you to follow us on Twitter and Facebook. If you have any questions, send email to us at scripter@microsoft.com, or post your questions on the Official Scripting Guys Forum. See you tomorrow. Until then, peace.